Mt. Misaka Kurodake Trekking (御坂黒岳トレッキング) has a great view of Mt. Fuji. It is located in the outer mountains of Mt. Fuji, Yamanashi Prefecture. This trail takes about 5 hours and has a great view of Mt. Fuji. It travels from Misaka Mountain Pass to Mt. Misaka that is 1596m high to Mt. Kurodake that is 1792m high. There is parking space and restroom. 1. use local bus to Tengachaya. The altitude: 1,792m from the sea level. Mt. Kurodake is the one of outer mountains of Mt. Fuji located in Yamanashi Prefecture. It is 1792m tall mountains with great view of Mt. Fuji and Lake Kawaguchi. 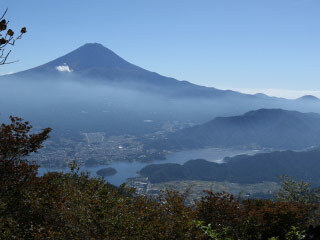 It is chosen as one of 300 best Japanese mountains in Japan and 100 best Yamanashi mountains. The trekking takes about 5 hours for round trip. Start at Misaka Mt. Pass, Tengachaya Tea shop. Back to Misaka Mt. Pass.